This is one young lady who grabs life by the ears and gives it a good shake. Para Dressage rider Sydney Collier has a huge character, bags of talent and sometimes, purple hair. So much so that she won the FEI's Against All Odds award at the 2014 FEI Awards ceremony in 2014. As well as this, she's now also in Rio for the Paralympic Games, representing the USA in Para-Dressage. Syd, how would you describe the relationship you have with your horses to someone who has never ridden before? I've always said that this is one of the most difficult questions to answer because the relationship between a rider and a horse is something that words can't even really describe. You both need each other in order to be successful and the horse relies on you to give it the cues when riding. Even on your worst days you need to be the best for your horse because they trust and depend on you. The horse can feel when you're feeling down and they always find a way to make you smile and laugh! They have always been my best physical therapy. For non-horsey folks, Dressage can look slow and ‘easy’. It can't be, surely - otherwise there would be no Olympic champions, would there?? In the best of dressage tests, the rider makes it look easy because they cue with small aids physically that the horse interprets subtlety, making the test look smooth and effortless. Para-Dressage is no different, although sometimes the aids we use are slightly different, depending on our disabilities. For example, I am allowed to use my voice in my tests, but when I do, I try to make it as soft as possible so as not to distract from the beauty of the movements. Dressage at its heart is about harmony between horse and rider, and while it may look easy from the outside, we riders spend countless hours with our partners learning to speak with each other in the quietest language possible. How do you train in the lead up to a competition? I wake up at about 8am, eat some oatmeal or a protein bar for breakfast, drink my coffee, then I head to physical therapy. I normally do a core workout or a different intense workout in the morning before heading to the barn. There, I ride my first horse, Western Rose. My lessons vary between working on my para tests, specific movements and gait transitions, or trail rides to give the horses conditioning and a break from the ring, and balance exercises. After I ride Rosie, I eat a high protein lunch to give me energy to ride the next horse. After lunch, I get Wentworth all tacked up and ride him! After that I head to the gym for a cardio workout. Woh, that's more than I do in a month. And you have Wyburn-Mason Syndrome as well? When I was first diagnosed with Wyburn-Mason, it was very difficult for me, being 7 years old and having such a rare medical condition. I wanted people to know I was going through something serious and it took me a while to really be able to explain it to people. Probably the biggest obstacle for me was learning to accept the new me and my body after my stroke at the age of 11. At first I had a mind-set of, ‘great, I had a stroke, there goes any chance of accomplishing anything amazing with my life’. As I came to terms with the new me and found the world of Para-Dressage, I realised that I could do it despite the challenges I had been facing, and that was one of the most empowering moments of my life! I realised that I could accomplish huge things despite the physical restrictions my body placed on me. It was the thought of being able to inspire others that helped me get through the hardest times in my life. Never give up, no matter how big the challenge or obstacle in front of you seems. It is always possible with hard work and perseverance. What was your reaction to winning the FEI Against All Odds award? Pure disbelief, honestly! It was such an incredible honour to win, as there are so many amazing and deserving individuals out there! When I got the call, I screamed with happiness – my parents wondered what was going on! Well, you earned it! Right, quick ones...Do you have any other pets? I have a service dog who is a Standard Poodle. He's the most amazing service dog a girl could ever ask for! He's goofy and like any other dog without his harness, but when he has his harness on he knows his job is to watch over me and make sure I'm ok. He has a list of tasks a mile long and he's helped me become so much more independent. Got a favourite quote or saying you like? Woah - deep. What do you like to do when you're not on a horse or at the gym? I love cooking and going to concerts. Creepy. Right, best of luck over the next few days, Syd. Any parting words? Definitely just a big thank you to everyone who has helped me accomplish my goals over the years. It takes incredible horses and people surrounding me to achieve what I have, and I can't begin to express my heartfelt appreciation. 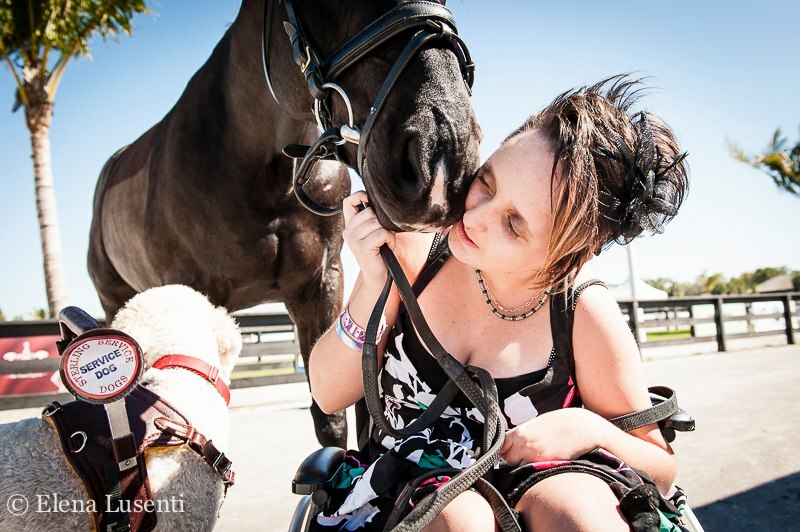 My stroke may have changed my body but my heart and soul remain determined to change the world's perception of the disabled, one hoof beat at a time!